Product #60734 | SKU ES-T17-A V2 | 0.0 (no ratings yet) Thanks for your rating! 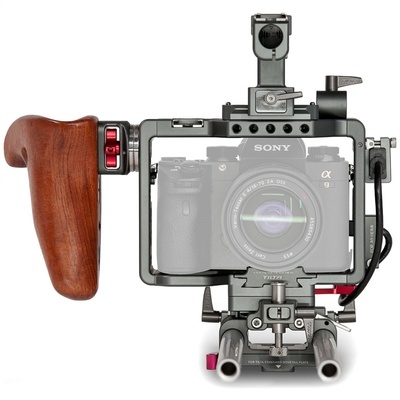 Protecting your Sony a7 series camera and improving its handheld ergonomics for shooting are just two of the many features of the Tilta ES-T17-A V2 Handheld Camera Cage Rig. The precision-machined formfitting cage is made from aluminium alloy, providing a balance between durability and strength as well as numerous threaded 1/4"-20 accessory mounting points. Once the camera is mounted in the cage, the included micro-HDMI to HDMI cable connects to the camera's micro-HDMI port and is clamped in place, providing a full-sized HDMI connector. This makes it easier to connect HDMI cables and means you don't have to worry about wearing out or damaging the micro-HDMI port by repeatedly plugging and re-plugging a micro-HDMI cable into your camera body. The HDMI plug protector clamps the micro-HDMI adapter cable in place and attaches to the cage itself, acting as a strain relief and providing a platform for the full-sized HDMI connector to attach, so it doesn't just dangle freely. The cage features an orientable and removable wooden grip for user comfort, as well as a removable top handle that features 1/4"-20 accessory mounting points and a cold shoe. The cage also includes a 15mm LWS support rod system featuring rod clamps, a pair of 30cm threaded 15mm rods, and three 1/4"-20 threaded helical coil inserts for attaching the rod support system to a separately available baseplate, tripod, or other 1/4"-20 mounting equipment. The cage attaches to the included 15mm LWS support rods via a quick release system that allows you to easily remove the cage, for a minimum-sized shooting package or quickly remounting the camera to the rods. The design of the system ensures that the lens' centre height to the rods conforms to industry standards for using rod-mounted accessories. The included EF and PL supports work with available Metabones EF and PL mount adapters (must be purchased separately). This formfitting cage features 89 1/4"-20 threaded mounting holes, useful for attaching accessories like the included single 15mm rod clamp. The top handle features an accessory cold shoe mount, and can be oriented either facing forward, rear, or to either side. It mounts via a top rail and can be slid on and off from either side. Integrated into the top handle are nine 3/8"-16 and twelve 1/4"-20 threaded accessory mounting holes. The 15mm LWS support rod system features three 1/4"-20 helical coil inserts for tripod mounting and an integrated Tilta-compatible dovetail (dovetail plate not included). Included lens mount adapter supports are compatible with Metabones EF and PL-to-E-mount adapters. Locking levers are of the standard Tilta spring-loaded design.